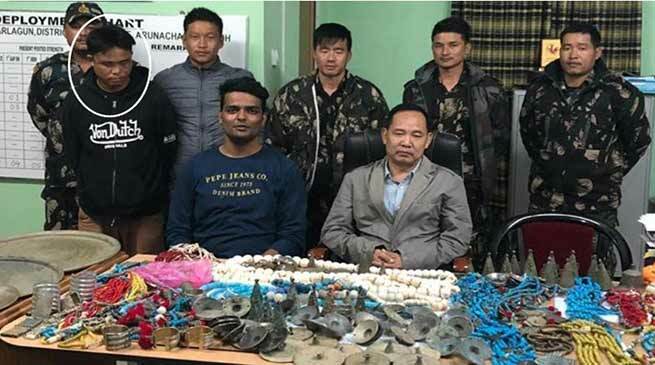 Capital police arrested ‘Jewel thief’ of Arunachal Pradesh from Naharlagun and recovered ornament worth of rupees 90 lakhs. Capital police arrested a 25 year old ‘jewel thief’ Tapum Godak and recovered stolen property worth lakhs of rupees. Arresting of Tapum solved several burglary cases registered in Naharalgun and adjacent police stations. Capital SP M Harsha vardhan inform that after receipt of multiple complaints of thefts of local jewellery like beads etc with the same modus operandi, a special team of Naharlagun police consisting of SI S.S Jha, SI D.Pakam and party under the supervision of SP Capital M.Harsha Vardhan, SDPO Naharlagun Make Bui was constituted and the team through its efforts arrested the alleged accused from Naharlagun on the night of November 15 and after due interrogation the accused led the police team to recovery of the stolen jewels. The value of the stolen jewels is being estimated but as per complaints it is nearly 90 lakh rupees. The arrested accused Tapum Godak is a skilled burglar and along with accomplices, he has been entering into the houses of victims with help of special equipment under the cover of night, after making them unconscious with the help of some external agents. Vardhan said that Tapum Godak is a habitual offender and resident of Kamle district. Several cases of jewel theft registered and charge-sheeted against him at Raga and Daporijo PS. SP assured that the accomplice of the arrested accused who is a resident of Assam would be arrested soon and all the stolen property whose value might run into crores would be recovered and people involved in selling and buying of the stolen property with knowledge of its origin would not be spared as well.